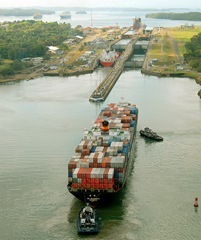 On August 15, Panama Canal celebrated 95 years of safe shipping. Panama City, August 14, 2009 – Tomorrow, the Panama Canal will celebrate 95 years of service as an engine of global trade and national growth. Since the steamship Ancón’s inaugural Canal passage August 15, 1914, the waterway has offered safe, reliable and efficient service to more than 983,000 transits. The Canal will reach the significant mark of one million transits next year.